Royal DSM, the global Life Sciences and Materials Sciences Company, is introducing Stanyl® ForTii™ T11, an innovative high temperature polyamide 4T delivering UL94-V0 flame retardancy combined with outstanding thermal and mechanical performance. This halogen free material has been designed to meet the stringent regulations and high performance requirements for printed circuit board (PCB) terminal blocks that are mounted using surface mount technology (SMT). Stanyl ForTii T11 complies with European directives governing restriction of hazardous substances (RoHS) and waste electrical and electronic equipment (WEEE), and results in components with significantly lower carbon footprints than versions made in rival materials such as liquid crystal plastics (LCPs) and polyphthalamides (PPAs). “Sustainable design,” the philosophy of designing products to comply with the principles of social, economic, and ecological sustainability, has recently been gaining significant interest in the electronics industry. As well as aiming for reduced energy consumption, original equipment manufacturers (OEMs) are increasingly restricting the use of halogen-based flame retardants in plastics. For high-temperature engineering plastics typically used in terminal blocks, there is not always a drop-in solution that meets engineering and cost targets. In addition, the size of the connectors is continuously decreasing while their electrical performance requirements are increasing. These demanding combinations are leading to new complex designs. DSM leveraged its Bright Science and deep understanding of the electronics market to develop Stanyl ForTii T11. This innovative grade is perfectly suited to meet the needs for the high performance halogen-free terminal blocks, and outperforms existing polymers currently used for the application. Terminal blocks connect printed circuit boards (PCBs) to external devices. They are commonly used in industrial machinery, automation, transportation and building infrastructure. Obviously they need to ensure good electrical connections that will last for many years. Conventional wave soldering of terminal blocks onto PCBs is being steadily replaced by surface mount technology using through-hole reflow soldering, or SMT THR. This new process is less costly, more environment-friendly, and much more reliable – reject rates with SMT THR are less than a tenth of what they are with wave soldering. Many defects are the result of a blistered terminal block. What terminal block makers need, therefore, is an injection molding material that is consistently capable of withstanding SMT THR processing conditions, while also meeting such needs as high flow for production of thin-walled components, very good mechanical performance, high flame retardancy, and compliance with global environmental regulations. Stanyl ForTii T11 answers all these requirements. The biggest advantage of Stanyl ForTii T11 is its performance during SMT THR soldering. This material was developed to meet the top moisture sensitivity level, MSL2, according to IPC/JEDEC J-STD 020D, which classifies materials according to their moisture sensitivity. The less moisture the material absorbs, the lower its tendency to blister during soldering. Stanyl ForTii T11 has better blistering performance than PPA and also better long-term heat ageing, says Duis. “And compared with LCP, it has better electrical performance, especially in smaller designs with high electrical loads.” It is the first high temperature polyamide certified by the VDE (Association for Electrical, Electronic & Information Technologies) up to 0.4mm, using glow wire tests carried out according to the household appliance standard DIN EN 60335-1. Stanyl ForTii T11 has been approved or is currently under test at leading terminal block producers. WECO Contact GmbH in Hanau, Germany, a leading global supplier of surface mount devices, decided last year to use the advantages of Stanyl ForTii T11 for all terminal blocks as well as pin strips in its SMartConn product range. Its latest product, the 830-A-111-SMD terminal block, with a pin pitch of 3.5 mm and a total space requirement on the PCB of just 97 mm², offers high performance in a very small space. It is ideally suited for reflow soldering, and with its white Stanyl ForTii T11 housing, it is ideally suited for use in the lighting industry. 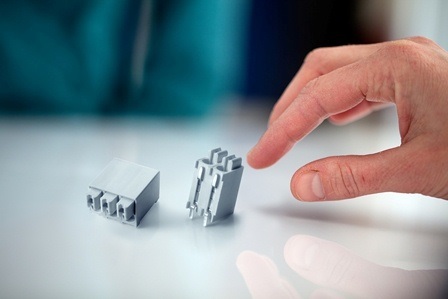 WECO says the new terminal block represents the perfect combination of the new high temperature resistant material with highly sophisticated connection technology. More information can be found at www.dsm.com/electrical-electronics and www.stanylfortii.com.